Click here to visit our SAT Prep Course Page. What is ScholarSkills Online Learning Academy (S.O.L.A.)? ScholarSkills Online Learning Academy is a live, interactive, online institute which helps students to gain better grades in school, achieve higher scores on tests, and qualify for admission to schools that offer them the best. ScholarSkills also offers private tutoring and test preparation at its headquarters in Brooklyn, NY. What is the S.T.A.R.S. SAT Prep Scholarship Program? S.T.A.R.S. is an acronym for Studious Teachable Ambitious Responsible Students. S.T.A.R.S. offers hard-working, economically disadvantaged students full access to our long-term premier preparatory program through need and merit-based financial aid. ScholarSkills also offers private tutoring and test preparation at its headquarters in Brooklyn, New York. Why is this intensive, long-term preparatory program necessary, especially for economically disadvantaged students? The SAT scores of economically disadvantaged students continue to plummet. Short-term test preparation simply does not address or redress the substantive educational deficiencies that these students have faced throughout their academic careers as a result of having lived in under-resourced communities. Indeed, one of the greatest mistakes parents and students make in preparing for the ACT and SAT is to invest time and money in short-term test prep courses that emphasize strategy over content. While these courses can be effective for students who have already shown significant mastery of either test’s content, they cannot help those who need to review and master the cumulative verbal and mathematical skills that the tests assess. How much does our long-term, premier preparatory program cost? Our long-term learning program offers four times as much as other online prep programs and is priced accordingly. Programs that are short-term and strategy-based offer four to six weeks of classroom instruction. ScholarSkills offers six months of live instruction and self-paced interactive skill-building mastery lessons. Test prep companies charge approximately $900 for four to six weeks of brush-up lessons. ScholarSkills charges $2,400 in tuition for six months of intensive, skill-based lessons that lead to success in school and on standardized tests. ​Yes! Full and partial scholarships are available through the S.T.A.R.S. Scholarship Program. What do the scholarships cover? And how are they allocated? 50% tuition reduction leaving the program’s tuition cost at $1200 which would be payable in installments of $200 over six months. 75% tuition reduction leaving the program’s tuition cost at $600 which would be payable in installments of $100 over six months. 100% tuition reduction leaving the program’s tuition cost at $0.00. Please note that registration, resources, and assessment fees in the amount of $199 are not covered by tuition scholarships and are required for enrollment. This includes 9 hours of proctored real SAT exams with personalized, actionable score reports, books and digital learning resources, and guaranteed lifetime access to our interactive skill-building library of lessons in reading, writing, and math. How are students selected for the S.T.A.R.S. Scholarship Program? S.T.A.R.S. is highly selective. Candidates qualify for this program, not simply by demonstrating significant financial need, but by showing that they are Studious Teachable Ambitious Responsible Students (or S.T.A.R.) who are eager to learn and willing to work tirelessly in a quest for the very best. How do students apply for this program? Students must complete an online application. Parents or guardians must complete a brief online financial aid application. S.O.L.A. is a long term preparatory program. As such, students will be required to devote a minimum of 144 hours over six months to intensive skill building in reading, writing, and mathematics to prepare for the skills that are assessed on the most important standardized tests. Enter your email address and click the button below to receive two free pdf e-books of the most important word builders (roots, prefixes, and suffixes ) for improving your SAT Reading and Writing Scores. Vocabulary is extremely important for success on the SAT. 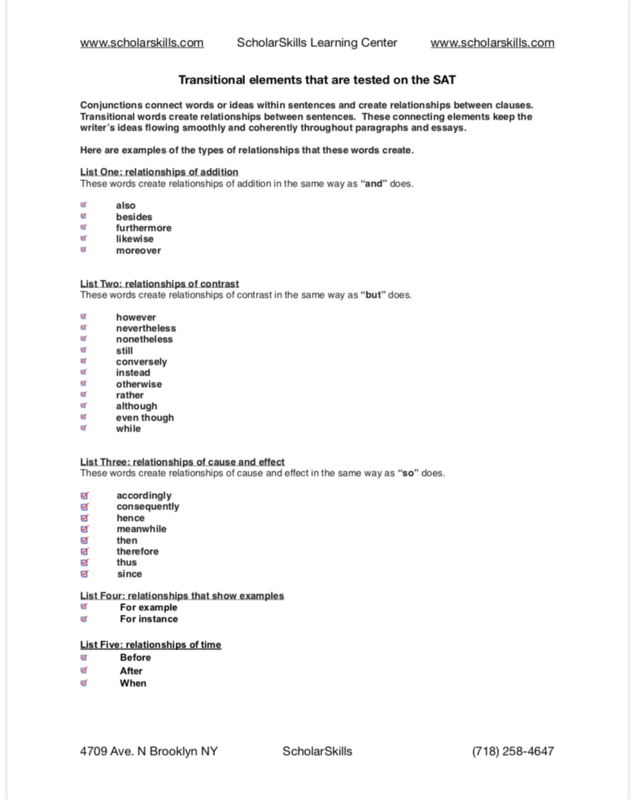 Click below to download the printable list of transitional words and phrases tested on the SAT.